Devon’s natural environment is incredible and varied, from Dartmoor and Exmoor to the more than 300 miles of stunning coastline. The Devon environment is important in that it provides us with food, fuel, pollination, flood control, great recreational and business opportunities, even a natural health service. The environment is an asset which cannot be taken for granted. It underpins life in Devon. However, our native wildlife species and habitats are under pressure, with only 36% of Sites of Special Scientific Interest and 32% of rivers classed as being in good condition. The connections between Devon’s communities, economies and environment need to be strengthened and need to ensure the assets of the natural environment are properly valued and therefore safeguarded into the future. To enable this, Natural Devon, the Devon Local Nature Partnership (http://www.naturaldevon.org.uk/) was established in 2012. Its three main aims are to protect and improve Devon’s natural environment, to grow Devon’s green economy and to reconnect Devon’s people with nature. To achieve these aims, seven interconnected priority themes have been identified. These are naturally healthy, green connections, outdoor learning, farming with nature, wood for good, resilient wetlands and sustainable seas. Poor air quality negatively affects human respiratory and cardiovascular systems and is strongly linked to asthma and mortality. In the short-term, high pollution episodes, perhaps associated with heat waves for example, can contribute to the premature death of people who are more vulnerable to daily changes in levels of air pollutants. Objectives are set for nine main air pollutants within Defra’s Air Quality Strategy, and where these objectives are not met, the local authority must declare an Air Quality Management Area (AQMA). 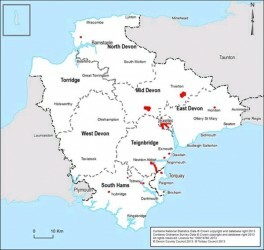 There are 12 AQMAs in Devon shown in the map in figure 6.2. All areas are designated as AQMAs for excessive levels of Nitrogen dioxide which is a pollutant from road traffic which can cause increased vulnerability to respiratory infection and may cause infection of the lungs. The Crediton AQMA is also designated for excessive levels of particulate matter below 10 microns in diameter (PM10) which is predominantly emitted from diesel engines without particulate filters. The proportion of mortality attributable to particulate air pollution in Devon is 3.7% which is below the South West average of 4.4% and England average of 5.4%. An area’s tranquillity is determined by the levels of noise and visual intrusion from major infrastructure such as motorways, A roads, urban areas and airports and defined by the Campaign to Protect Rural England. An increase in areas disturbed by noise and visual intrusion has been seen with the greatest increase being seen between the early 1960s and 1990s, during which a 154% increase in land area affected by noise and visual intrusion. 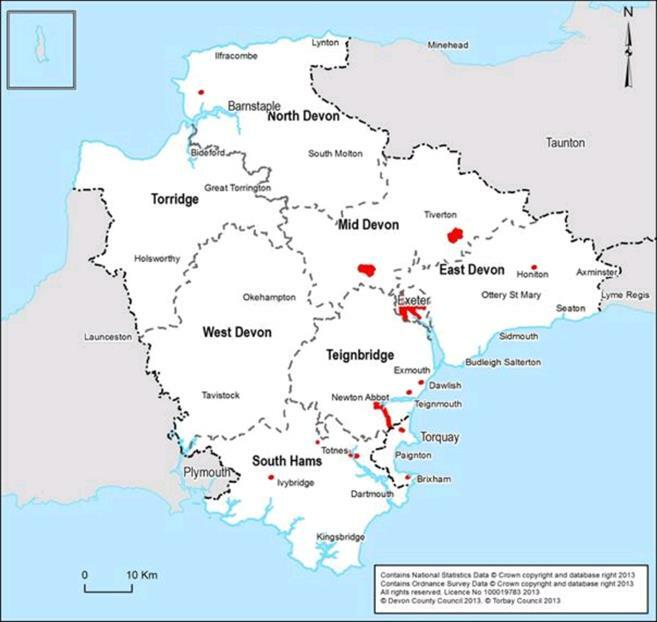 Over this time, Devon became more urbanised, the M5 motorway was constructed and the A38, A380 and A30 roads were dualled. 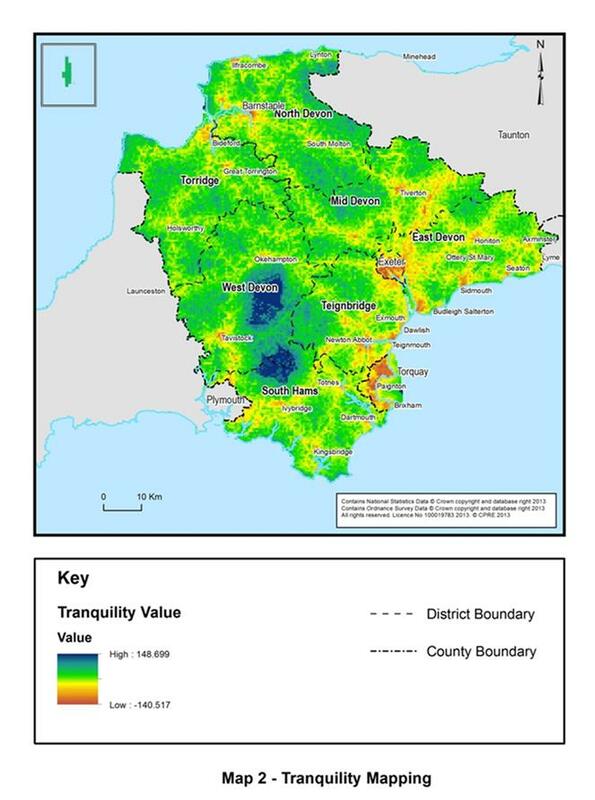 Figure 6.3 maps the tranquillity levels in 2007, showing the sparsely populated areas of central Devon as the most tranquil and the lowest levels following the major roads and urban settlements in Devon.